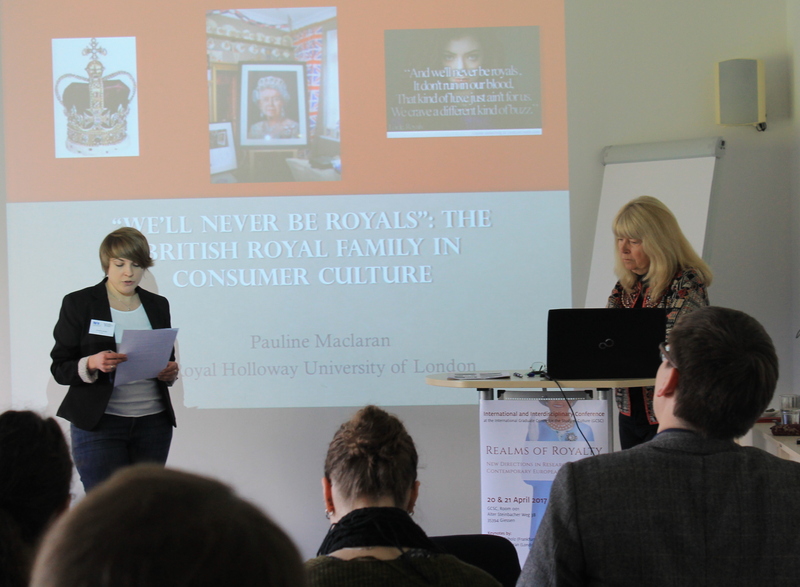 Imke Polland and Christina Jordan have just organized the successful conference on Realms of Royalty (20/21 April 2017) in Gießen, Germany, which questioned the role of royalty and monarchy in today’s societies. Bringing Royal Studies to the modern day is also part of their on-going doctoral research on Queen Elizabeth II’s Golden and Diamond Jubilee as Staged Media Events: A Case Study in the Production of Collective Memories (Christina), and Plurimedial Representations of the British Royal Weddings 2005 and 2011 as Ritual Media Events (Imke). We caught up with them to learn more about the discussion of the conference (see conference report by Max Bergmann here), and their research on modern monarchy. Cathleen and Kristen: Thank you for doing this interview! To start, could you please tell our readers a bit about the conference, and how it started? Christina and Imke: Right from the outset of doing research on contemporary monarchies, we noticed a significant lack of scholarly attention to this topic, as most studies dealing with royalty pursue historical research interests. Monarchies post WWII are usually only treated marginally at conferences and there are very few publications dedicated to researching their contemporary representations and standing in society. We think that current monarchies pose special challenges to researchers, which differ from the demands that historical research on monarchies has to face. Their role as post-political institutions and their adaptation to ever-changing media environments turns them into a dynamic and rich object of research, which requires interdisciplinary analytical perspectives. Monarchies offer many starting points for exploring aspects that are of crucial interest to scholarly fields as varied as cultural, media and literary studies as well as sociology, law, political and economic science. The conference’s aim was to further this interdisciplinary dialogue on contemporary monarchies by raising questions such as, how do monarchies adapt to change, reinvent themselves and navigate between past, present and future to ensure the continuity of the institution? What are the possibilities of contemporary monarchies facing the loss of (political) importance, power, space, relevance, and popularity? How are the relevance and the roles of these seemingly anachronistic institutions negotiated? Where does the perpetual interest in monarchies stem from? During the two days of the conference we discussed, among many other topics, the role of contemporary European monarchies in national and transnational contexts, the British monarchy’s post-war public relations strategies, royal representations in (fictional) media products (such as radio broadcasts, TV series, and films) and (re-)appropriations of monarchical symbols in popular cultural contexts such as wrestling, comics, or alternative music. Cathleen and Kristen: The conference was not only focused on European monarchy but also colonialism, transnationalism, and the global entanglements of royalty, maybe discussed most prominently by Cindy McCreery. Could you tell us a bit more about this? Are modern monarchies by definition more of a global actor? Christina and Imke: European monarchies have been global actors for a long time. The most prominent and obvious example might be the role of the British or Spanish Crown within their respective Empires. As Cindy McCreery showed at our conference, when discussing ways in which royalty matters to people overseas, monarchy and imperialism are intricately entwined. She argued for a research on monarchies that extends the gaze to the view on royalty from abroad. With the end of Empires, the role of monarchies has, however, not been diminished. Processes of decolonisation resulted in an increasing mobility of members of the European royal families that still continues today. The royal tours are a striking example of how people and royals interact. These tours work as a stage on which not only the monarch can be displayed and paraded, but they also allow for local responses. A recent example is constituted by the visit of the Duke and Duchess of Cambridge to Germany in July 2017, during which they intended to “reinforce the strong and wide-ranging ties between Britain and Germany”and thus acted as cultural ambassadors – especially in the face of the ongoing Brexit negotiations. Because of the increasing relevance of social media as well as recent celebrations of royal events as global media events, contemporary monarchies are definitely increasingly globally engaged. The global popularity of, especially, the British monarchy goes hand in hand with their high degree of visibility and availability in global consumer culture (only think of various films, documentaries, TV series etc. produced about the British royal family in recent years). At the same time, however, one has to emphasize the ongoing importance of monarchies as national icons. Cathleen and Kristen: One of the core themes of the conference (and both your theses) is the use of media by royal dynasties which is also one emphasis in medieval and early modern royal studies – do you see any changes compared to the use of media in pre-modern times, or more of a continuity? Christina and Imke: We are convinced that monarchies undergo processes of change and self-fashioning while at the same emphasising and drawing on their own constancy. The use of media is essential for conveying these (self-)images. Traditional forms of media usage for the distribution of images, e.g. painted portraits or the likeness of the monarch on coins, persist and are complemented by new and digital media uses as monarchies and their public relations offices have to adapt to new media environments. Monarchies always exploit the media, which are both available and popular at the respective time. Although John Plunkett (2003) termed Queen Victoria the first “media monarch”, earlier monarchs can also be viewed as media monarchs. A prime example is Queen Elizabeth I whose portraits were both censored and widely circulated. When celebrity culture developed and the collection of memorabilia became popular in the 19th century, new forms of distributing royal images, e.g. the cartes de visite, emerged. These cartes opened up a whole new way of personal engagement with royal images, as they depicted less formal moments than former portraiture, thus inviting emotional reactions. These kinds of depictions were sold in large numbers and were collected and highly valued by their gatherers. As Deirdre Gilfedder and Ed Owens mentioned in their conference presentations, in the 1930s and 1940s, radio was a popular medium to address the public, e.g. during war speeches and the inception of the famous Christmas broadcasts. In 1953, the coronation of Elizabeth II was the first royal media event broadcast on TV. The medial omnipresence of monarchies still seems to increase steadily. Nowadays, monarchies permeate people’s lives not only in the (yellow) press and on TV, but they also make use of social media channels and networks – on 24 October 2014, Elizabeth II sent her first Tweet. The British royal family embraces the possibilities offered by new media and actively participates in the digital world via various Twitter, Facebook, YouTube, and Flickr accounts. Cathleen and Kristen: Everything to do with royal families, esp. the British one, is today being commercialized. How important is this commercialisation, and does it work only (or foremost) on a national scale, or even in an international market? Christina and Imke: Commercialisation plays a very important role for contemporary monarchy. When looking at the British monarchy in particular, one can say that the whole institution is ‘managed’ as a global brand that caters to consumer demands and has to be beneficially and strategically placed on the market to be successful. Recent studies (especially Balmer 2011, Otnes/Maclaran 2015) have analysed this brand management and the role that the British monarchy plays in global consumer culture. There has also been an increase in societal pressure for the monarchy to actively and significantly contribute to the British economy. In this sense, former political pressures have yielded to commercial (and media) interests. Understanding the British monarchy in marketing terms, Pauline Maclaran has suggested, means conceptualising it as a brand complex, involving different brand components, which speak to and potentially enhance the consumer’s (emotional) bonds to the brand. She explained that these different components are the global brand, the human brand, the family brand, the heritage brand, and the luxury brand, which all cater for different consumer demands and, thus, make the royal family brand complex so successful. The monarchy can be consumed in various ways: There are a great variety of popular cultural products like books, films and TV series. Royal media events and memorabilia produced on the occasion of these events offer forms of interaction and participation. The monarchy also makes available touristic experiences, e.g. by opening state apartments and palaces to visitors. Furthermore, granting royal warrants for products supplied to royal family members is a long-established practice of royal engagement in commercial activities. Several members of the royal family have also created consumer brands, such as Duchy Originals, the organic food brand selling local products established by the Prince of Wales, or companies protecting the personal brand and intellectual property rights of royal family members, like the ones William and Catherine created. The Royal Collection Trust, which manages the royal collections and the opening of the palaces as well as the production of merchandise, is one key company involved in making the monarchy available for consumption. In her lecture, Pauline Maclaran pointed out the interesting paradox of ‘accessible mystique’ which results from the PR efforts of the monarchy. The royal family has to provide previously unavailable levels of access in order to engage in these marketing activities, while at the same time retaining an upmarket appeal and sustaining narratives of the institution’s past and present mystique. Even though the prime market for the consumption of the royal family brand concentrates on the national context, it is important to consider global dimensions, for example concerning tourist experiences and souvenirs or royal media events and memorabilia. Cathleen and Kristen: What were your impressions of the discussions on the conference? Which new directions in research were emphasized, and how do they fit into the wider field of contemporary history? 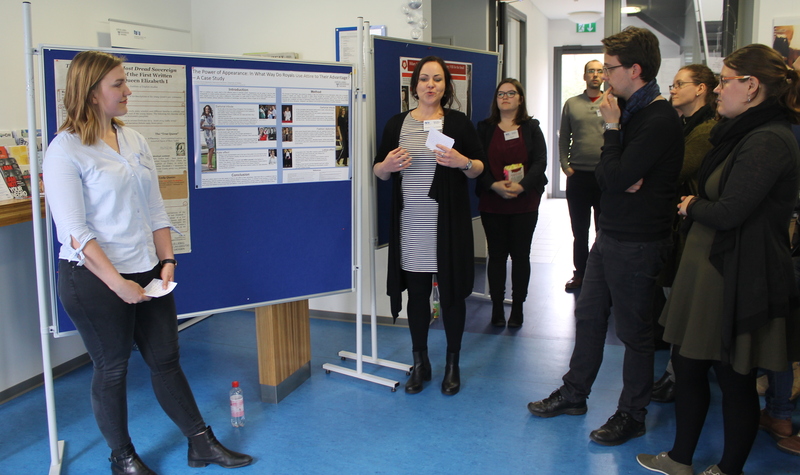 Christina and Imke: The conference presentations and discussions showed clearly that the changes monarchies have undergone in the past century and that they are still undergoing are mirrored in changing interests and perspectives of research on these monarchies. Two major aspects were emphasised recurrently in the course of the conference: Firstly, the impact that monarchies have on people’s everyday lives has changed from political decision making to an omnipresence of sovereigns and monarchical topics in popular cultural contexts, ranging from films and TV series to exhibitions of royal dresses and even wrestling. Consequently, these new “realms of royalty” deserve scholarly attention and promise valuable insights beyond historical perspectives. Secondly, the increasing importance of emotional connections between monarchy and the people was highlighted. Ed Owens discussed efforts to redefine the monarchy’s place in the nation and to endear the royals to their subjects by strategic media usage and the formation of a new royal public language throughout WWII. Very recent developments include the propagation of narratives on the side of the monarchy that suggest accessibility and middle-class values and thus serves to enable the people to emotionally connect to members of the institution, e.g. when Princes William and Harry openly discussed their psychological struggles dealing with the early death of their mother in a video available on various online platforms in April 2017. The most productive aspect of the conference, we find, was the interdisciplinary exchange, which linked diachronic perspectives with synchronic, and national with transnational ones, thus providing new insights on European monarchies as the common object of research. In this way, the conference explored monarchies beyond historical perspectives and succeeded in its endeavour to discuss, evaluate and make sense of the cultural phenomena that contemporary monarchies confront us with. By looking at the present state of monarchies as a space of negotiation, we were able to map out and open up new perspectives and understandings of the domains of royal studies that focus on contemporary transnational interactions. 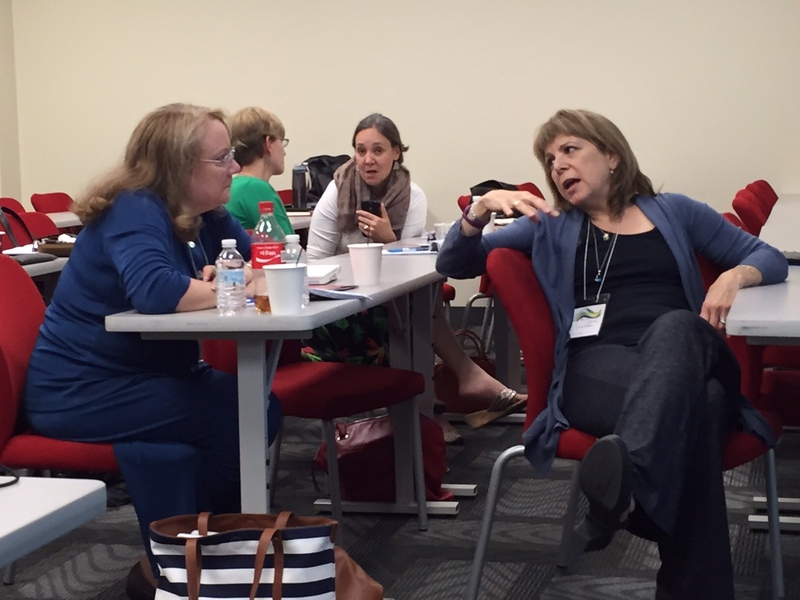 Cathleen and Kristen: Thank you for these insights into your conference! Now, finally, could you tell us a bit more about your own research, and how royal studies fit into this? Christina and Imke: We are both doing research on media events of the British monarchy that took place in the new millennium – the latest royal weddings and Elizabeth II’s crown jubilees. Our research continues traditional strands in the study of (modern) monarchies, e.g. by focussing on ceremonial events following David Cannadine’s seminal work on the re-invention of the British monarchy. Central for our research are media-related aspects, such as the analysis of TV broadcasts of the events and the medial prelude and aftermath of the events in the press. We hope to add to existing research on monarchies and answer to a recent surge in royal studies by bringing in new theoretical perspectives, first and foremost from the fields of narratology, cultural memory studies and the study of media events, and by analysing recent developments that have barely been in the focus of scholarly attention so far. Cathleen and Kristen: Thank you both so much, and good luck with your research! Cf. Higson, Andrew. (2016) “From political power to the power of image: contemporary ‘British’ cinema and the nation’s monarchs.” In: Merck, Mandy (ed.). The British monarchy on screen. Manchester University Press, 339-362, here: 360. Just at the beginning of this month, on October 6th&7th, the University of Edinburgh hosted the conference Saints and Sinners: Literary Footprints of Mary and Margaret, Queens of Scots, organized by Claire Harrill and Lucy Hinnie. This conference was supported by the Institute for Advanced Studies in the Humanities (IASH, University of Edinburgh), the Society for the Study of Medieval Language and Literature (MEDIUM ÆVUM), and the Centre for the Study of the Middle Ages (CeSMA, University of Birmingham). Heta Aali from the University of Turku (Finland) kindly send us her conference report to share the discussions with all of you. Have you been to an interesting conference lately? Send us your impressions! Heta Aali: With eight speakers and two keynote lectures, by Dr Sarah Dunnigan (University of Edinburgh) and Dr Catherine Keene (Southern Methodist University, Dallas, TX), the conference allowed for a productive discussion and a profound exchange of thoughts on representations created by and of the medieval queens in question. As the title of the conference indicates, the focus of the conference was on literary footprints of the two famous Queens of Scots, Mary I (died 1587) and St Margaret (died 1093). Yet, the topic was to be interpreted comprehensively, as could be seen from the wide range of approaches in the papers, and it was understood more in general as images of medieval queenship, gender, and women’s reading and writing. Noteworthy is that many papers focused on the literary representations of famous queens created by men. And moreover, as all the speakers were women, this also meant that at the conference, women explored the way men had examined famous medieval queens. This point did not escape the attention of the participants and in the final roundtable discussion the problem of gender segmentation between disciplines was brought up and the way literate studies (especially about queens) are so strongly identified as “feminine” field. The conference started with two presentations on saintly medieval queens, and also a little bit on non-saints. My own presentation started the conference with a discussion on the representations of Merovingian queens created by early nineteenth-century French historians. Minji Lee (Rice University) continued by presenting Hildegard of Bingen’s and Birgitta of Sweden’s idea on childbirth. Mary Hardy from Aberdeen University focused in her paper on the way Queen Margaret was used by later authors to emphasise Catholic devotion in various European educational institutions whereas Amelia Heath from King’s College, London examined successfully how Margaret’s gender was presented as crossing the gender norms, or rather, as stretching the boundaries. Amy Hayes, also from the University of Aberdeen, discussed the problem of using sixteenth-century sources in studying the Middle Ages and the fifteenth century. The problem is relevant to all those studying the Middle Ages or any remote period with only few sources left and therefore the question in how far we can trust those later sources. Unfortunately, there is no clear answer since the sources are often difficult to replace even if their context of writing is known to be problematic. Allison Steenson (University of Edinburgh) presented her very interesting research project concerning the Hawthornden Manuscripts. The first keynote lecture, by Dr Dunnigan, focused on Mary, Queen of Scots, as a poet, a side of her which was very interesting though fairly seldom discussed in research. In Dr Dunnigan’s presentation, Mary was not only the object of male writing but she herself participated actively in the creation of her own image. The second keynote lecture, by Dr Keene, discussed the images and imagenary of Margaret and Virgin Mary holding and reading books, and more generally the association between women and books in the Middle Ages. The last two presentations, by Kate Ash-Irrisari (University of Manchester) and Anne Rutten (University of St Andrews) examined the Scottish queens’ later reputation and images especially during the Stuarts’ rule over Scotland, and later also England.. The conference concluded with a round table discussion with all speakers and other participants in which the general arguments and major themes of the conference were drawn together. Queenship and textuality was first brought up as a major theme since most speakers examined the textual images of the queens. Secondly, women’s writing was emphasised; either as queens who wrote or as historians writing about queens. What were these women permitted to write and what not? Thirdly, and most interestingly, it was discussed how women were remembered, who controls their representations, and the polarized opinions on politically significant women. It seems that historians, authors, and political thinkers used similar literate devices and models to either promote or derogate the queens depending on the political situation and on author’s affiliations at the time of the writing. Female sovereignty, authority, and national identity were relevant questions in many presentations. The medieval, early modern, or nineteenth-century authors’ and historians’ opinions about female sovereignty and national identity played an important role in the creation of the representations despite the differences in time and place. What united the women discussed in the conference was that they were all somehow described as escaping the gender frame imposed by contemporary and later historians and authors. The gender frame(s) differed from one time to another, from one place to another, but the queens were often pictured as not quite fitting in. In addition, several questions were raised concerning the current academic situation of studying medieval queens. For example, the question of how disciplinary boundaries, or strict separation of disciplines, affect the research was brought up. The strict boundaries were even seen as possibly hindering the research. Research of medieval queens calls for interdisciplinary approaches that would take into consideration textual and material cultures simultaneously. According to many participants, the relevant disciplines continue to be gendered which can also affect the outcome of the research. It was agreed that one should aim to overturn the preconceptions on and juxtaposition of “soft” and “scientific” history. The conference participants also had the chance to enjoy a short presentation of the ongoing “Dangerous Women Project“. It aims to discover the different meanings of “dangerous women” by publishing every day for one year a blog of what it means to be a dangerous woman. Each day the blog has a different author and approach to the question, thus offering a wide range of answers. Not long ago, on March 16th-18th 2016, the ERC funded project at the University of Oxford The Jagiellonians: Dynasty, Memory and Identity in Central Europe hosted a conference on Dynasty and Dynasticism, 1400-1700. We asked Milinda Banerjee (Presidency University, Kolkata), Hélder Carvalhal (CIDEHUS, University of Évora) and Jonathan Spangler (Manchester Metropolitan University) to send us their impressions from this conference! Thanks to Milinda, Hélder and Jonathan for their reports on the conference! Just drop us an email if you are also interested in sharing your thoughts about a conference you’ve been to! Milinda Banerjee: The conference operated at the intersections of three scales of enquiry, bridging histories of Central and Eastern Europe (in the Jagiellonian sphere of control or influence), of late medieval and early modern European monarchies in general, and of global (including extra-European) dynastic polities. The introduction by the project leader Natalia Nowakowska (Oxford) sketched some of the main historiographic shifts in thinking about early modern dynasties and dynasticism over recent years, across disciplinary (historical, anthropological, and sociological) strands. The plenary lectures by Jeroen Duindam (Leiden) and Craig Clunas (Oxford) highlighted the need to think about early modern monarchies in global frames, in terms of parallels, connections, and divergences between different royal-dynastic polities from China to the Islamic world to Europe and Africa, while the plenary lecture of Paula Sutter Fichtner (CUNY/Brooklyn College) focused on the more specific case of the Habsburgs to draw out broader questions about the links between kinship, affective languages, and political power. The plenary lectures as well as the many individual papers all highlighted a certain common theme: that dynasty and dynasticism has not received adequate conceptual and critical recognition in historical scholarship, given that the presence of royal dynasties has often been taken for granted as a historical background, rather than rigorously analysed as a framing category in its own right for both historical actors and modern scholars. A majority of the papers focused on questions of representation and contestation, in the sense of how the royal (or even, non-royal, such as papal or aristocratic) dynasties represented themselves in terms of political thought and categorization, artistic and ceremonial language, and emotive vocabularies, and how their articulations were complicated, challenged, and destabilized by a plurality of social actors. Many of the panellists investigated how such self-consciously articulate dynastic languages interacted with other political idioms, including those provided by various religious systems and various sorts of patriotic, republican, or even (proto-) nationalist conceptual systems. Issues of gender were highlighted by several papers which focused on the gendering of power and the scope of female agency. Papers on China, West and Central Asia, and India brought new interesting extra-European perspectives into dialogue with early modern European frames of analysis. The concluding roundtable summarized some of the overarching discussion themes, even as the diversity of voices in the roundtable as well as in the preceding panels made it quite clear that ‘dynasty’ is better seen as a heuristically useful tool of analysis rather than as a monolithic category that can erase other social and spatial diversities. Hélder Carvalhal: It is hard to encapsulate three very productive days in just a few words. As a result, this brief report is based on the sum of two aspects. First, I will generally approach how participants faced the central theme of the congress. In a parallel way, I will introduce some elements of what and how much I learned in those three days. Thus, the following lines are necessarily biased by my personal experience and interest. Apart from keynote speakers, individual papers will be addressed together regarding their respective themes. Despite of being organized by an ERC-funded project dedicated to the study of Jagellonians, the congress was rather open and inclusive. With a set of papers approaching various issues concerning the major European dynasties at the period, although not exclusively, Dynasties and Dynasticism did accomplished its main goal – to reassess what exactly we known as “dynasty”. Conceptual debate became quite clear right since the beginning. Initial interventions of Natalia Nowakowska and Jeroen Duindam underlined the need of exploring dynasties on a more profound way, therefore overcoming static definitions and pre-established common-places. The latter’s recent comparative work about this subject (Dynasties: A Global History of Power: 1300-1800, 2015) also drew attention to certain aspects which eventually came around during parallel sessions. Concretely, I am referring to issues as legitimacy (including competition for the throne and the destiny give to siblings/collaterals) or models of ruling (with particular interest on how rule of women affected dynastical power, among other phenomena dealing with diffusion/concentration of power). Obviously, with such diversity of themes and geographies, comparative perspectives with other continents (especially Asia and Africa) did appear sporadically. In fact, such exercise has its merits, one of them being the general impression that European monarchies during the studied period are extremely homogenous and arguably much closer to its Asian and African counterparts than we initially thought. Interest discussion raised by Craig Clunas in his keynote approached the upwards of studying Asian dynasties, as well as the existence of several “Asias” in opposition to an image of a nearly homogeneous continent. This last debate, promoted by the most recent Sanjay Subrahmanyam´s piece on Asian connected histories (“One Asia, or Many? Reflections from connected history”, Modern Asian Studies 50, 1, 2016, pp. 5-43) brings food for thought regarding not only Asia, but other regions. If one neglects the Eurocentric perspective, perhaps a similar question can be asked: is there one Europe, especially regarding dynasties? There are some distinctive features, particularly in what concerns marriage, succession and primogeniture. Apparently, something happened within numerous European political units and respective dynasties during the late medieval and early modern period. The conference showed that in many cases we do see legitimacy urges on the behalf of the monarch, projecting a constructed image for political purposes. Used mechanisms were usually confined to the creation and maintenance of the memory (genealogies, often forged; spaces and buildings, etc), the refinement of old-fashioned court rituals (ceremonials and etiquette, but also military/chivalric orders) and to a careful considered matrimonial policy. Several presentations explored these aspects (among others, Brero, Zupka, Coman, González Cuerva). In the same vein, dynastic consciousness as an issue was perhaps the most common aspect during the presentations. It is curious to verify that dynastical image construction could serve for internal political purposes (dynasty as a “family corporation”) – as Piseri and Van der Steen contributions showed – but also when the time for affirm sovereignty regarding external intentions came round. Another popular concept, connected with the latter and raised numerous times during the sessions, was competition. It was not a particular surprise, since – as the initial keynotes noted – rivalry and antagonism usually happened when dynasties face diverse problems. Hence, many of the presented case studies referred themselves to competition within the same or between two or more dynasties. In sum, it was a very pleasant, intense and rewarding event. As an early career researcher, I learned and benefitted immensely. Not only because of the content itself – note that Eastern Europe historiography not always receive a lot of attention in this “fringe” of Europe, nor post-graduation programmes contemplate reasonable input about the said region – but especially in what concerns the main debates within the study of dynasties as a space of observation per se. Jonathan Spangler: It would be difficult to summarise three days of stimulating papers in a few short paragraphs. And on top of the value of such a breadth of shared comparative research, there is the warmth of collegiality to be commented upon. For three days, scholars from all over the world congregated in Somerville College, Oxford, brought together by the team of the Jagiellonians research project, led by Natalia Nowakowska, and shared their research but also their passion for history with one another. I’ve been to many conferences, and this was among the better of them in terms of a spirit of shared endeavour, over coffee breaks, in the dining hall over breakfast, in the pub, and in the final discussion that rounded off the conference. All I can do here is offer a few highlights, and share some of the insights I took away with me. In terms of comparative research and experience, this conference did two things, bridging the gap between European and non-European specialisations, but also the divide that often runs between medievalists and early modernists. This divide has been smoothed over quite a bit recently, for example by groups such as the Royal Studies Network, and it is certainly a trend that should continue. Amongst French historians in particular, there has often been a curious division between the reigns of Louis XII and François I, as if the Renaissance suddenly burst forth in an instant, banishing the darkness. It was unfortunate, therefore, that French academics were quite under-represented at this conference. In contrast, it was a wonder to share so many discussions with eastern European scholars, naturally brought together by the theme of the Jagiellonians, the amazing dynasty that at various points ruled over Poland, Lithuania, Bohemia and Hungary. We were also privileged to learn more about dynasties outside Europe: Turks, Mongols, Manchus. In general, I can summarise the larger points taken away by delegates through points raised by two of the keynote speakers and by the leaders of the concluding roundtable discussion. Jeroen Duindam (Leiden), as usual, delivered a broad-ranging talk full of stimulating illustrations drawn from his recent book (Dynasties: A Global History of Power, 1300-1800), that demonstrated that dynasties across the early modern world shared many characteristics. Duindam offered three concise thinking points about dynasticism: that it can be divided roughly into two systems (concentrated or diffuse); that legitimacy was a concern shared by all ruling families; and that Europe did seem to have an exceptionalism (a ‘Sonderweg’) that made its dynasties distinct (mainly monogamy and primogeniture). Craig Clunas (Oxford) then helped draw in several points from the conference for further discussion, notably what exactly was meant by a dynasty in historical terms, and whether the study of dynasties is useful to the historian. As a Chinese specialist, his talk was particularly convincing, coming from a historical field in which ‘dynasty’ defines almost everything about a period, rightly or wrongly. His conclusion was that we can use such a term meaningfully, but that it must also be seen as fluid and changeable, and that ‘trans-dynasticism’ is equally valid. Senior historians who participated in the round-table, notably John Morrill (Cambridge) and Martyn Rady (University College London), stressed the nature of cultural transfer across dynasties (as alluded to by Clunas in his keynote address); the role of dynasties in state building (and the incorporation of other elites into dynastic identity beyond those connected by blood); the shared culture of dynasticism that extended far beyond the ruling families into villages and households of ordinary people; and the reception of this culture by those same ordinary people. Jitske Jasperse shared her conference report with us on “Seals and Status 800-1700” at the British Museum from December 4th to 6th, 2015. 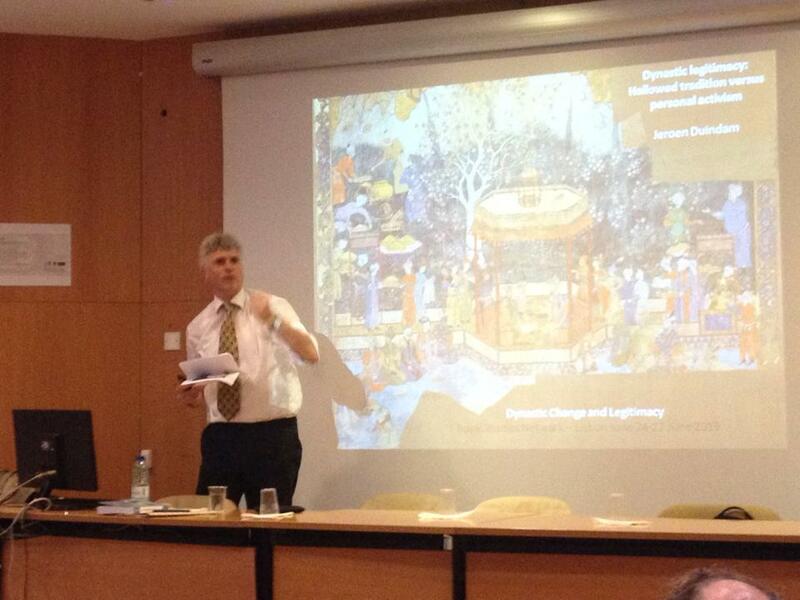 Have you also been to an interesting conference in the field of Royal Studies? Send us your conference report! The conference Seals and Status 800-1700, held in London’s British Museum from 4-6 December 2016, was an engaging conference. This was largely due to the variety of topics addressed: from the well-known seals of kings and queens to those of the lower classes, from seal matrices from Anglo-Saxon England to Chinese seals on paintings and lead seals in Byzantium, and from saints and seals to the manufacturers of seals and their production process. In addition, the multidisciplinary approach, with speakers presenting material from different perspectives, certainly stimulated the exchange of ideas and was inspiring for those who would not label themselves sigillographers. While no justice can be done to all individual contributions, some general observations can be made. Materiality turned out be an important theme. While this might not come as a surprise, that many seals survive as fragments and are often detached from the documents they were originally attached to can make us forget that these wax of lead objects were originally related to matrices, parchment, cords and other seals. Moreover, they were of specific dimensions, shape, colour (green, red, brown/black, and natural) and material, as Elke Cwiertnia and Paul Dryburgh demonstrated. Markus Späth’s paper on city seals from the Upper Rhine region cleverly showed that iconography of German wax seals attached to a charter of 1284 in which the towns of Speyer, Worms, Mainz and Strasbourg agreed to a two-year peace (Landfrieden), instigated by King Rudolph I of Habsburg, is just one element that aids to our understanding of the function and meaning of the seals. Size and the sequence of the seals as attached to the parchment charter (of which three copies exist, originally one copy for the five party involved) were and are equally important for our understanding of the seals’ use, function and the status of the parties involved. Späth’s research is part of a project ‘Verkörperung kommunaler Identät’ in which fingerprints that are left in Speyer’s wax seals are forensically investigated. Brigitte Bedos-Rezak emphasized that fingerprints found in the wax are life size and that through these imprints the body was incorporated in the seals. Fingerprints are thus part of the sealing process and offer an extra level of identification. While we do have little information on the actual sealing of documents, it is evident – amongst other from fingerprints – that seals were not merely markers of an agreement, but that they also were part of gestures and ritual. The relation between ritual and seals was investigated by Laura Whatley who studied the iconography of lead seals in the Latin Kingdom. She argued that the depicted architectural features and liturgical objects, such as censers and lamps, were not simply meant to refer to an actual building (with the Holy Sepulchre as the most famous), but also to evoke the place and its rituals. These objects were thus about the active imprinting of (past) experiences. These social aspects of seals – the way people interact with them – were also addressed by Mei Xin Wang in her paper on Chinese seals as stamps of status on Chinese paintings and calligraphy. The so-called Admonitions Scroll (fifth to early seventh century AD) from the British Museum are a fine example of Chinese art collectors who stamped their seals on paintings in order to proof their ownership, as well as to demonstrate their status and taste. In addition, the seals add to the value of an artwork since they are proof of its provenance. As a result both art and seals were collected. Seals became an integral part of painting and even a scholarly form of art. The use of seals was, however, not restricted to the happy few, as became evident from Elizabeth New’s discussion of the seals below the nobility and knightly classes in medieval England and Wales. Even though these seals offer more challenges than those of the nobility because of their (sometimes) poorer quality and absence of legends, this should not withhold us from investigating them, as Judith Bennet’s research on medieval working women reminds us of. Thinking about the relation between seals and status, can – and should – also include the way women interacted with seals. Louise Berglund, in a paper on illustrious ladies in Sweden, pointed out that sealing is a social practice since it involves consent and participation of several persons. Overstepping the social boundaries related to sealing practices could lead to problems of authority. Turning to royal women, such as Birgitta of Sweden, Berglund reminded us that the absence of seals, as is the case for Birgitta although charters survive, must not be taken as straightforward evidence that women played no part in matters of state. Although the mentioned examples leave much unsaid there’s no doubt that seals, even when small, in poor condition and often are detached from their original material surroundings, trigger many questions and offer inspiring food for thought. In some ways, “Beyond Exceptionalism” was a continuation of a conversation begun three years ago at Kalamazoo. Around the lunch table, several of us who have been working with powerful medieval women for decades expressed our frustration at continuing to hear papers and read articles that characterized a powerful woman as an “exception” to the “rule” that medieval women do not exercise public power. Surely, we decided, it was time to move “beyond exceptionalism” and accept that it was more normal than not for elite women to be in positions of authority and to exercise public power. Amy Livingstone took the lead in organizing a series of roundtable discussions about women and power at the International Medieval Congresses at Leeds and Kalamazoo in 2014 and 2015; the first two of which centered on the central medieval period, while the last looked at the earlier Middle Ages. These discussions, sponsored by the Haskins Society and Medieval Prosopography, helped inspire Heather Tanner, Associate Professor of History at the Ohio State University, Mansfield, to organize this conference. The small size of the conference, limited to about two dozen participants, allowed all papers to be heard in plenary session. Several of the papers at the conference dealt with women in urban settings, such as Tiffany Ziegler’s look at the sisters and patrons of the hospital of St John in Brussels or Christopher Kurpiewski’s study of the Penitent Sisters of Speyer in the thirteenth century. Caitlyn McLoughlin argued that social and cultural power was also exercised outside the court and family and examined Capgrave’s “Life of St Catherine” to show the way a text could shape and reflect perceptions of that power. Most of the papers dealt with the careers of countesses or the forms of power exercised by other elite women in Catalonia (Jeff Bowman), Norman and Angevin Britain (RaGena DeAragon, Linda Mitchell, and Alexis Miller), Flanders (Els De Paermentier), Ponthieu (Kathy Krause), Brittany (Amy Livingstone and Katrin E. Sjursen), and Hesse (Nadine Rudolph). All of the papers were sophisticated and informative, but I suspect that readers of this blog will be most interested in the papers that dealt specifically with queens and queenship. Theresa Earenfight and Miriam Shadis were the invited, featured speakers. Miriam’s paper, delivered on Friday, examined the earliest Portuguese queens, especially Theresa of Portugal (d. 1130) and her female descendants through the thirteenth century. Unusually, we learned, the daughters of Portuguese monarchs were referred to as “queens” and participated in royal governance in the early years of the new nation. Theresa’s Saturday paper, “Standpoint Epistemology and the Problem of Exceptional Medieval Queens” posited that the reason we continue to see medieval queens as exceptional is related to the fact that both medieval and modern political theorists tend to ignore queens and other women when they talk about “questions of tyranny, queenship, civil society, consiliarism, urban corporatism and republicanism, and the earliest examples of popular politics,” ignoring the examples of women exercising power that stared them in the face. Theresa used the example of Catherine of Aragon (d. 1536) and her activities to demonstrate that even very obvious public roles like regencies and judicial actions by women are often overlooked in master narratives. Heather Tanner’s contribution echoed Theresa’s in that she called for greater study of female lords in light of developing administration of kingdoms and counties, particularly in the period after 1250 or so when, according to the McNamara/Wemple thesis, they are no longer supposed to be doing so. Lois Huneycutt’s paper took the conference to the South Caucausus and the reign of Tamar the Great of Georgia (d. 1213). Arguing that even the most successful of medieval women had to operate within a climate of residual misogyny, Lois showed how Tamar systematically manipulated existing royal imagery to a female context, and also bolstered her authority by linking herself to the language and visual imagery of Georgia’s national saint, Nino. Erin Jordan’s paper drew on her recent work on the Latin Kingdom of Jerusalem and examined the reign of Constance of Antioch, who served as Princess Regnant in the Principality from 1131-1160. The idea of a woman ruler was not necessarily problematic in the Latin East, so Constance was in some ways completely unexceptional, except that she had to deal with her mother’s reluctance to allow her to come to the throne, military exigencies, plans to marry her to a Muslim prince, and two tumultuous marriages. 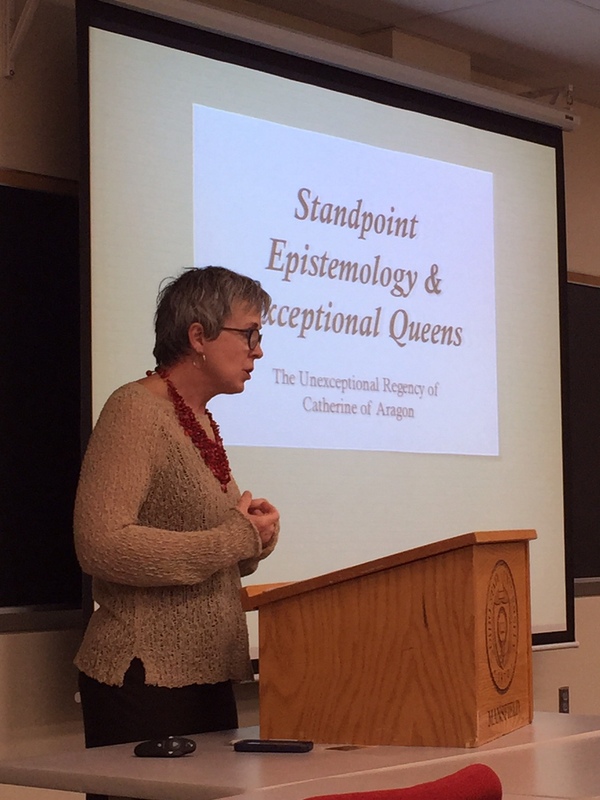 Kristen Gaimen’s presentation on Anne of Bohemia (d. 1399) questioned the idea that “success” at queenship necessarily involved producing an heir, and examined the reasons for Anne’s unquestioned popularity in England, which she attributed to skillful patronage and successful intercession. And finally, Nina Verbanaz investigated the roles of the Salian empress consorts in creating dynastic roles and legacies, primarily through their foundation, patronage, and continued relation with Speyer Cathedral. Speyer became a dynastic mausoleum for both male and female members of the dynasty, and the rites and rituals performed for family members served to further their memories and strengthen the dynasty. The conference ended with a stimulating round table discussion which included all the presenters as well as Laura Gathagan and Charlotte Cartwright, who had each chaired a session. Unlike previous public round table discussions that many members of this group had participated in, this one made no attempt to define slippery concepts like power, authority, and autonomy; we simply seemed to accept that whatever it was, women shared in it and exercised it. There was a lot of reference to foundational work by scholars not present at the conference, including (but not limited to) Kimberly LoPrete, Constance Bouchard, John Carmi Parsons, Nuria Silleras-Fernandez, and Charlotte Newman Goldy. The name Georges Duby did come up once. The group included a good mix of senior and emerging scholars, and toward the end of the discussion we formulated “calls to action.” On the scholarly side, we all lamented the lack of even a good textbook that covered later medieval Europe, much less an up to date study of political theory that incorporates the findings of the last thirty years. We also agreed that, while the conference had been an utterly invigorating experience, we had spent the weekend preaching to the proverbial choir. We challenged ourselves, particularly the privileged tenured among us, to take our abstracts and our papers to new, less comfortable venues, and present our work in military history conferences, political theory conferences, and other places where queenship and medieval women’s public power might not routinely be discussed. 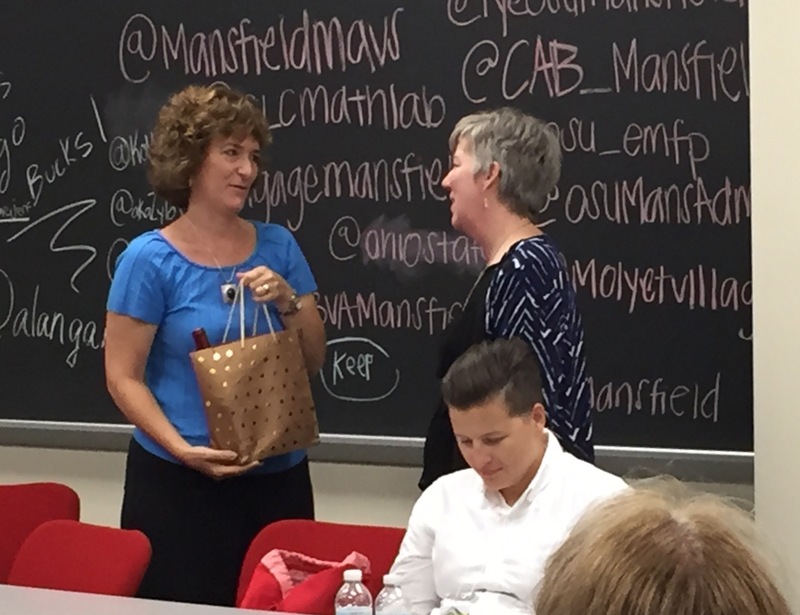 All of the attendees warmly thanked Heather for her work in organizing the conference. Plans for a proceedings volume are currently underway. From June, 23th-27th 2015 the Royal Studies Network met for the first time outside of England – in beautiful Lisbon, Portugal. 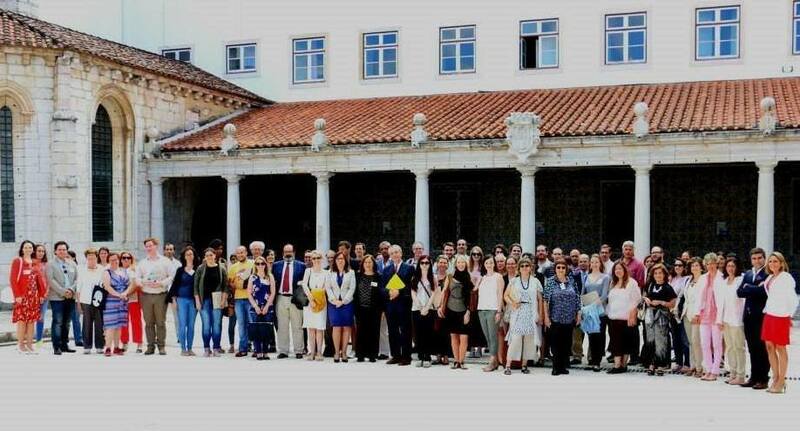 The conference “Kings & Queens IV: Dynastic Changes and Legitimacy” started and ended at two monasteries, and in between discussed in 11 sessions all things Royal Studies at the university of Lisbon. A real feature of K&Q4, which was an innovation for the conference series, was the addition of excursions tied to the opening and closing ceremonies. Both excursions were sites linked to Philippa of Lancaster in connection with the 600th anniversary of her death. The opening ceremony was held in the monastery of Odivelas, where Philippa died. The delegates were treated to a tour of the monastery, where King Dinis was buried and an insightful opening keynote from Cesar Olivera Serrano. Following our visit to the monastery, the delegates were treated to a reception and exhibition hosted by the mayor and town of Odivelas. The closing ceremony took place at Batalha, a glorious monastery built near the site of the battle which ensured the success of the Avis dynasty and home to the tomb of Philippa of Lancaster, her husband Joao of Avis and many of their sons. A second, unfinished chapel for royal family, containing the tomb of King Duarte and his wife Leonor of Aragon, was particularly striking. The closing ceremony included talks on Philippa by Maria Helena da Cruz Coelho and Saul António Gomes both from the University of Coimbra. The municipality treated us to a lovely meal-indeed several municipalities provided receptions and meals for the delegates during our stay. 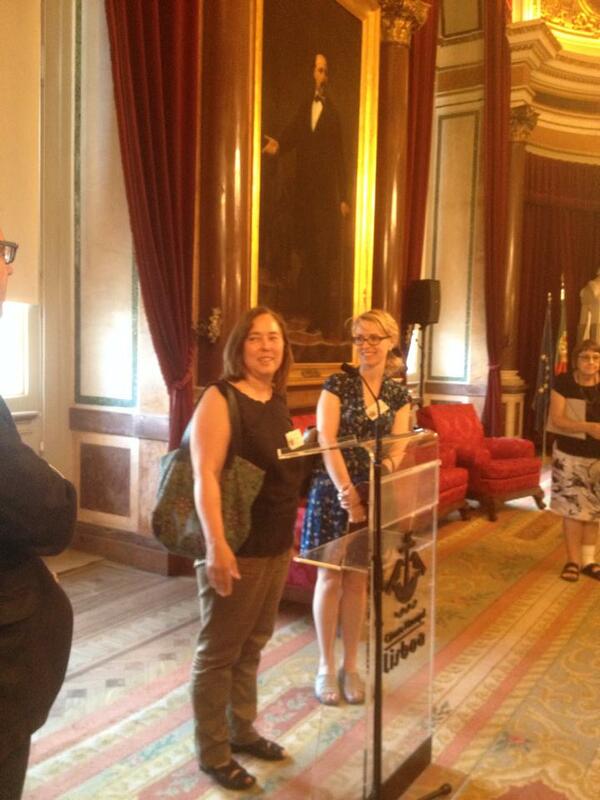 Appropriately perhaps, we visited the city hall of Lisbon for a port wine reception, held in the very room where the end of the Portuguese monarchy was announced! The Keynote on Dynastic Legitimacy was given by Jeroen Duindam (University of Leiden) who just finished his book Dynasties. A Global History of Power, 1300-1800 which will be out in November 2015. Duindam looked at legitimacy of dynasties, including not only the more known European examples but also examples from Africa and Asia. Afterwards, the conference participants split into three groups for the parallel sessions. With sessions on elective monarchies as well as hereditary monarchies, Muslim and Christian monarchies, from the European north to the European south, from biblical times up to after the French Revolution, with papers on Russia and China, Portugal and Spain, and spanning European monarchies from ancient times until around 1800, there were interesting things to re-discover, learn anew, discuss, question and comment for all interested in Royal Studies. With a slight focus on Portuguese and Spanish monarchies, as well as on medieval and early modern studies, there were nonetheless quite a lot of paper on (from this perspective) more exotic topics. See a few impressions from the conferences and discussions which a few of us live-tweeted in this Storify. And let me know, if you wanna join the ever growing pool of twitterstorians and report from your work in the field of Royal Studies! After the second issue of the Royal Studies Journal came out just before the conference (and if you haven’t seen it yet, go check it out – now! ), there were also more news to announce at this meeting: The Canterbury Christ Church University (CCCU) is sponsoring two prizes: one for the best new book in the field and another to recognize new research from students and early career scholars. The next “Kings & Queens on tour” is already planned: for the first time outside of Europe, the Kings & Queens V: Dynastic Loyalties will be on April 8-9 2016 at the Clemson University in Greenville, South Carolina (USA). The CFP Kings and Queens 5, 2016 is out now. So, will we see you at the next Kings & Queens-Conference? What were your impressions from this conference? Let us know in the comments, or send us an email.